Awful Conflagration of the Steam Boat Lexington in Long Island Sound on Monday Evening, January 13th, 1840, by Which Melancholy occurrence; over 150 Persons Perished. This is an 1840 view of the tragic burning of the steamboat Lexington on the Long Island Sound, New York. It was issued shortly after the disaster to satisfy public interest in the devastating event. 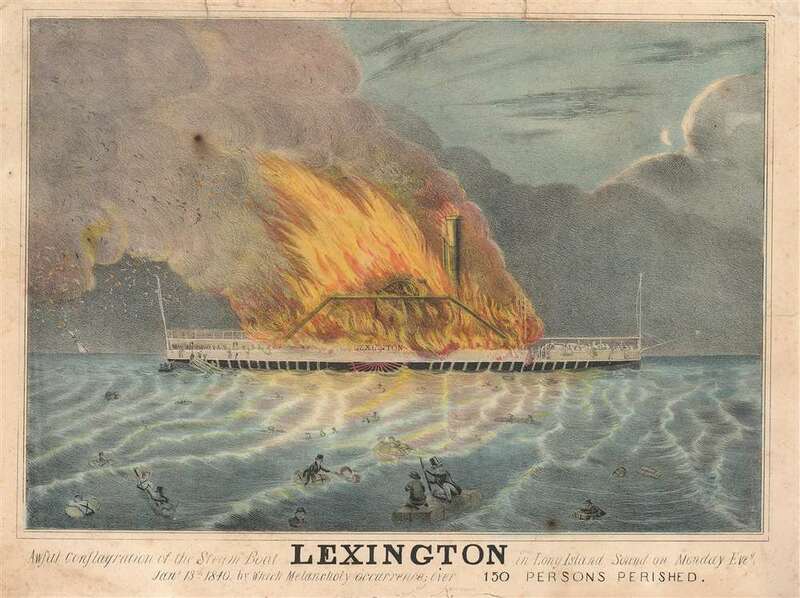 The burning of the Lexington was one of the greatest steamboat disasters in American history and captured the popular interest in a number of important views – this being among the rarest. The view illustrates the accident, which took place on January 13, 1840, and claimed the lives of all but four of the 143 people on board. The caption here states that over 150 perished, erroneous information that was probably due to the intense fervor for news regarding the disaster. The view expresses some of the chaos that ensued following the outbreak of the fire, with numerous passengers illustrated in the water and the full-to-bursting lifeboats that would eventually sink due to the number of people that had crammed into them. The Lexington, along with its passengers, was carrying a cargo of bales of cotton, which were in the end her demise. The cotton had been stored inexplicably close to the smokestack, which caught fire halfway through the voyage to Stonington, and ignited the bales of cotton. The fire burned through the drive-rope, making the Lexington unnavigable, leaving her to drift out to sea. By midnight, those left on board were forced to jump into the frigid water and died of hypothermia. The Lexington sank by 3:00 a.m.
As this view is unsigned, we have been unable to trace the artist. Due to the cataloging of The Mariners' Museum and Park, we know that it was published by Jared Hurlbut and printed by W.S. Williams. No records for this piece exist in the OCLC and we have been able to locate an example in two institutional collections: at the Mariners' Museum and Park in Newport News, Virginia and at the Royal Museums in Greenwich, England. Good. Backed on archival paper. Infill along margin. Blank on verso. Bottom margin appears to have had an outline map of Long Island Sound, which as been particuall trimmed.